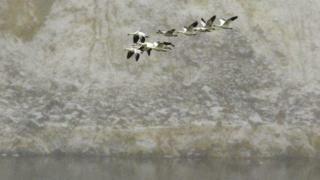 Thousands of migrating snow geese died after landing in contaminated pit mine waters in Montana, mine officials have said. Officials estimate that as many as 25,000 birds landed in the Berkeley Pit last week, and since then have been seen dropping dead in the area. Mine workers tried to prevent the birds from landing in the acidic wastewater, but were overwhelmed by their number. Each year several birds are found floating dead there, but never so many. "I can't underscore enough how many birds were in the Butte area that night," said Mark Thompson, an environmental affairs manager for Montana Resources, which controls the pit mine along with Atlantic Richfield. "Numbers beyond anything we've ever experienced in our 21 years of monitoring by several orders of magnitude,", Mr Thompson said, adding that they typically only see between 2,000-5,000 birds in the region each year during the summer and winter migrations. Between 2010 and 2013, the Environmental Protection Agency (EPA) only recorded 14 snow goose fatalities in the Berkeley Pit. In 1995, 342 snow geese corpses were found floating in the pit's metal-laden waters, leading federal authorities to force the abandoned mine's caretakers to take measures to scare off the birds. On 28 November, mine workers used "bird hazing" techniques to try to frighten the birds and prevent them from landing in the water, which is acidic enough to dissolve a motorboat's steel propeller, according to researchers. As the flock approached, they fired loud rifles and shotguns in the air, activated spotlights, and devices called Phoenix Wailers, which emit sounds of predators. But the "hazing" techniques failed to prevent the pit from appearing like "700-acres [2.8 k/sq] of white birds," Mr Thompson described. Researchers believe that the birds were forced to land due to an approaching storm, and were embarked on a late-season migration because of warming temperatures in their northern Arctic habitat which allowed them to remain there for longer. The mine's caretakers could face a fine if the companies are determined to have not been complying with the bird hazing programme.